The team, from the Zoological Society of London (ZSL) and Bawangling National Nature Reserve Management Office, had been monitoring the last 25 known Hainan gibbons when the call led them to a male, a female, and a black-tufted baby of four to six months. “The infant shows that this new group has sufficient resources to reproduce,” said the ZSL’s Jessica Bryant, noting that Nomascus hainanus—the Hainan gibbon’s Latin name—is not only the world’s rarest ape but also its rarest mammal. “To be honest, it was amazing,” says Bryant. While a 1994 ban on commercial logging of natural forest and a 1988 ban on gibbon hunting laid groundwork for stronger protection, several other factors brought the population back from the brink, according to Bryant. 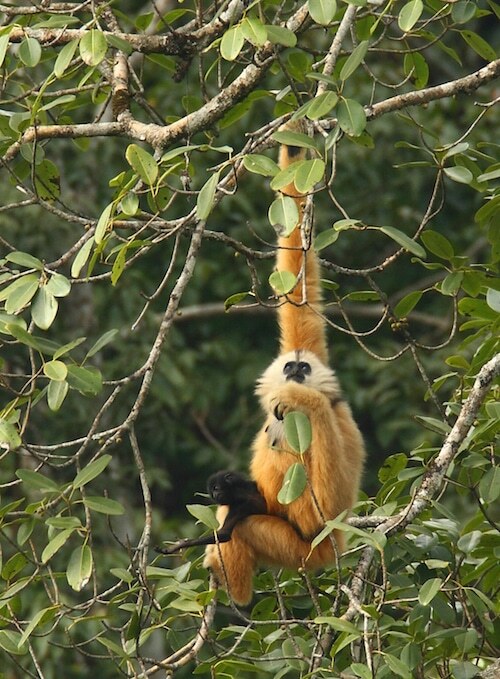 The 2003 expansion of the Bawangling reserve and a concerted mobilization of conservationists, in tandem with the gibbon’s listing as critically endangered,2 enabled the population to survive into the second decade of this century. The discovery was among the bright spots in gibbon conservation during 2015—designated the Year of the Gibbon by the International Union for Conservation of Nature Primate Specialist Group to underscore the emergency facing all 21 species of gibbon. Not one of the world’s gibbon populations is faring well, according to Ben Rawson, vice chair of the recently created IUCN Species Survival Commission Section on Small Apes, comprising 65 scientists. One species, the eastern black crested, or Cao Vit, gibbon (Nomascus nasutus), on the northern Vietnamese border with China, was thought to be extinct during the late 1980s and early ’90s but is coming back after an intensive effort by Fauna & Flora International and People Resources and Conservation Foundation which has countered major threats across the gibbon’s principal range of 7.7 square miles. Lifting the Cao Vit population to 130 from 110 individuals over the past 12 years involved community education and ranger recruitment, provision of fuel-efficient stoves to reduce forest firewood collection, forest restoration, and inter-governmental collaboration between Vietnam and China to designate adjoining protected areas in Cao Bang and Guangxi Provinces. Nearly 1,000 miles away, in Myanmar, the Wildlife Conservation Society (WCS) is hoping that early action to save the eastern hoolock gibbon (Hoolock leuconedys), will help this vulnerable species avoid further endangerment. With the eastern hoolock population having fallen by half to about 500,000 individuals over the past several decades, clamping down on hunting and the wildlife trade is a priority. WCS mobile teams use a range of educational tools to sensitize communities to the important ecological role that the gibbons play, such as in scattering seeds to regenerate tree growth in evergreen and semi-temperate forests. A growing component of gibbon conservation involves ensuring that those displaced from the forest are provided safety in sanctuary and returned to a viable range after rehabilitation. The Javan Gibbon Center, a rescue center in Western Java, Indonesia, cares for some 25 Hylobates moloch or Silvery gibbons, most of which were ripped from the forest as babies by illegal pet traders but were turned over to the center once they grew into unwieldy pets. Founded by the Silvery Gibbon Project (SGP), the center rehabilitated and released in April 2015 three gibbon pairs and a family group including two offspring, ages two and four, into a 38-square-mile patch of forest just outside of Bandung, Western Java’s capital. Reintroduction is a delicate proposition, says SGP director Clare Campbell, requiring staff to gradually dehabituate gibbons from their human caretakers. Then, the gibbons must find compatible mates who, once paired, spend a lot of time together grooming each other. These are small but important steps to save a species that has lost 98 percent of its Javan habitat to deforestation—first to logging for timber and paper production beginning in the 1960s and later for oil palm cultivation. The most significant reclassification, to critically endangered, says Rawson, is that of the southern white-cheeked crested gibbon (Nomascus siki), whose numbers in its natural habitat of southern Laos and central Vietnam, are estimated to be in the thousands. Rawson expects that more interest and investment in this species will follow from the new designation. 1 Zhang, Mingxia, John R. Fellowes, et al (2010) “Degradation of tropical forest in Hainan, China, 1991–2008: Conservation implications for Hainan Gibbon (Nomascus hainanus).” Biological Conservation, 143: 1397-1404. 3 Northern yellow-cheeked gibbon (Nomascus annamensis); Southern white-cheeked crested gibbon (Nomascus siki); Yunnan white-handed gibbon (Hylobates lar yunnanensis); Mishmi Hills hoolock (Hoolock hoolock mishmiensis).